Using social media for genealogy is all the rage. We're flocking to Blogs, and sites such as Facebook, GenealogyWise, and Twitter to share our family history, connect with living kin, and expand our research circles. But we're not the only generation with connections. Our ancestors made them too. We just have different tools. Sometimes it's difficult to think of our ancestors as "social butterflies." When we look at our pedigree charts we see names, dates, and places, and can recite who begat whom, but this doesn't tell the whole story. Our ancestors went to work, raised their children, and cared for their homes, but they certainly did not live in total isolation. In fact, quite the opposite is true, especially for newly settled immigrants who relied heavily on immediate family, relatives, friends, co-workers, and neighbors. They often socialized at school or work-sponsored events, church gatherings, clubs, and fraternal organizations affiliated with their religious beliefs or ethnic heritage. Think of it as "reverse social networking." "Cluster genealogy"--also sometimes referred to as whole family or extended family genealogy--is a popular technique for breaking down brick walls in the search for an elusive ancestor. Instead of just focusing on a particular person, you also look for information about the individuals and families to which he or she was connected. Two excellent (but often underused) sources are fraternal benefit society and social organization records. When our immigrant ancestors arrived in the New World, they often settled in enclaves within cities and towns and tended to cluster in specific regions in the United States. It was common for immigrants, particularly those who did not speak English, to travel together and put down roots among relatives, friends, or neighbors from their native land. These so-called "cluster communities" offered a place where the immigrants could transplant and preserve their culture, lifestyle and traditions as best they could in their new surroundings. Seeking to keep their culture as it existed in the homeland, immigrant groups frequently founded their own churches, schools, boarding houses, and other institutions, as well as forming their own academic, athletic, or charitable groups, and fraternal, occupational, and social organizations. Many also established their own ethnic presses that published newspapers and histories to highlight specific communities. Fraternal benefit societies became popular in the late 1800s to offer insurance, financial aid and camaraderie to immigrants, who often were employed in hazardous industries. At the turn of the twentieth century, almost five million men and women belonged to fraternal organizations. If your ancestors were living in North America at that time, chances are pretty good (about one in seven) that at least one of your ancestors belonged to a fraternal group. Start by asking your relatives whether they remember their parents or grandparents belonging to such organizations and if they have any dues books, literature, or photographs of anyone wearing clothing with special emblems, or any jewelry, medals, pins, china, or stationery, with a particular insignia. My parents and grandparents belonged to the First Catholic Slovak Union, the Greek Catholic Union, and fortunately saved some of their paperwork. If you don't have family documents, check notations in obituaries, or on gravestones. If the organization is still active, see if you can view old membership applications, death benefit claim forms and meeting minutes. See Cyndi's List for links to web sites for many ethnic, fraternal and other organizations. Check under the category "Societies & Groups" and "Fraternal Organizations." Also, check the Encyclopedia of Associations (Gale Research) for a list of organizations in the United States and worldwide. For Canada, consult the Directory of Canadian Associations. Try searching the Family History Library Catalog using the Keyword Search for "Fraternal Records." If you're contacting an active organization, be aware of privacy laws and or other circumstance that dictate which records can be accessed. Also, most records may not be indexed so tracking down our ancestor may be a difficult and time-consuming process. Most of these organizations are not staffed for genealogical research tasks; therefore, depending on the organization, you may not have great success at the national or state level, unless your ancestor happened to be an officer. Many fraternal organizations also published member updates in newsletters or newspapers. If the organization closed down perhaps the officers turned over records to research repositories. Try educational institutions such as the University of Minnesota's Immigration History Research Center, and the Historical Society of Pennsylvania's Balch Institute for Ethnic Studies. Both house special ethnic collections. Records are not always indexed so make sure you browse the collections fully. If you can't travel to do your research, check to see if you can borrow materials at your local library via interlibrary loan. If you're able to track down some fraternal organization records, you'll typically find they contain personal information included in the membership application and death benefit claim forms. The membership applications generally include date and place of birth, names of parents and siblings, religion, profession, place of residence (at time of application), and medical information. But it is important to note than some of the membership application forms may be incomplete and contain little beyond the name and date of birth of the concerned individual. Death benefit claims provide the date of death, but also contain much other information about the individual. The records may also help you to track the dates your ancestor arrived or left a given area in order to create a migration timeline for your family. In addition, the records show the offices the member held and this may give insight into the character of your ancestor or his or her standing in the community, and if the individual was well-respected, may have been written about in local histories of the county or town. There were various places for immigrants and their children to participate in recreational activities and build friendships. Scour high school and college yearbooks for photographs, or activities' lists that mention your kin. You may find relatives have old autograph books tucked away that reveal your ancestors' pals and best buddies. Sometimes these turn up in historical societies or museum collections, antique shops, flea markets, estate sales and eBay. The town library was often a gathering place as well, possibly providing basketball courts, a bowling alley, music hall, or even company-sponsored English language and or other classes for immigrants. For a list of libraries in the US see PublicLibraries.Com. Festivals, 4-H fairs, contests, parades or pilgrimages, and sewing circles also brought local residents together. Check archived newspapers for coverage of such events, including names of prize winners, group pictures, and the gossip pages for mentions of out-of-town visitors. The USGenWeb Project or Linkpendium can help you locate free information on county-level genealogy resources. Whether at school or in community-based leagues, sports provided a diversion from the drudgery of everyday work and camaraderie from the team atmosphere. Look for newspaper articles, old photographs, box scores, programs, and other memorabilia. Not only was the church or synagogue a place to gather for worship, but it also community provided a support network for your ancestors. Check member lists, tithing records, congregational histories, meeting minutes, anniversary booklets, published newspapers, or even records pertaining to church run orphanages or schools to see those who worshipped in the same congregation as your ancestor. Try USA church to locate a Christian church from your ancestor's hometown. Or try MavenSearch Jewish Web Directory. Working people rarely socialized at home. Friends and acquaintances formed social clubs where a drink served as the only price of admission. Many of these clubs were affiliated with a particular ethnic group and offered a sense of belonging in the community--where a workingman could build friendships during his few hours of leisure time. Typically each ethnic group had its own designated meeting place. 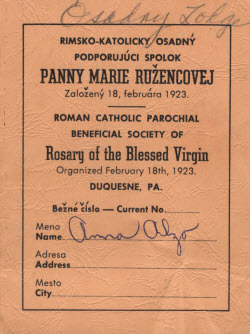 For example, in my hometown of Duquesne, Pennsylvania there was the Slovak Club (my father and uncles were members), the Carpatho-Russian Club, Croatian Club, Italian Club, among others. If the club is still active, inquire about old membership rosters. If it closed, perhaps a local historical society or library inherited some of its photographs, records, membership booklets, or special publications. For links to societies or groups, or search Google. If there was no designated club where your ancestor resided, drinking check city directories for listings of saloons or taverns--these, neighborhood establishments also often served as information centers, unofficial employment offices, banks or notaries. The local library or historical society may have records or old photographs. If your ancestor served his country, you may be able to track down others who served in his platoon or regiment. Check family ephemera (medals, diaries, scrapbooks, etc.) for clues. Draft notices in local newspapers, veterans' cemeteries and service booklets or records are also excellent resources. You'll find plenty of links on Cyndi's List. It's not really a "social organization," but the next time you visit a cemetery in search of an ancestor's gravesite, really study the names on the surrounding tombstones. Immigrants often were buried near their relatives and friends--especially in church or smaller public cemeteries. Always verify burials with the church or cemetery office, in case your ancestor could not afford a tombstone. Check for your surnames online at Find-a-Grave, Interment.net, and Names In Stone. Memorial sites such as Tributes.com, or MeM.com are useful sources for obituaries or tributes (Note: these sites tend to focus more on more recent deaths). If your ancestor belonged to a fraternal organization or other social group, don't underestimate the value of such connections when performing family history research. It may take a little extra digging, but you might just strike gold in a record you previously overlooked or did not even know existed!